For five long weeks, it’s been getting cold. It’s been getting dark. But the wait is over. The Boys are Back in Town. The last time we left Our Rightful Home, we were angry. We couldn’t believe what we’d seen. We questioned our position on the ladder, our commitment, our passion and our desire. We felt betrayed. We said some things that hurt. Jokes did the rounds of social media. Over-reaction became the norm and eulogies were written on the Warriors’ season. Brett Kimmorley was talking all sorts of rubbish. And then something magical happened. 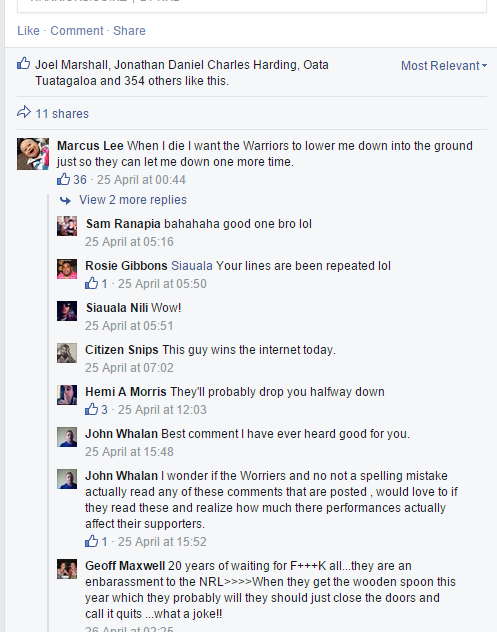 #TakeThatKimmorley was born, and with it, new hope that the Warriors could again sit atop the NRL throne. And while hope is a great thing, if the Warriors fail to build on their recent success, it will quickly disappear. They need to take that ‘You win or you die’ attitude in to this encounter, or Mt Smart could become a ghost town later in the season. Knights are historically known for their ability to charge, but these ones from Newcastle arrive barely at walking speed, with only 1 win since Round 4. The Warriors are heavy favourites with all the bookies and, with the Beast and Sam Tomkins returning, will aim to make a charge of their own over the Origin period as they look to solidify themselves in the Top 8. But, in saying that, it would be unwise to underestimate this Newcastle side. Their backline has plenty of attacking dangers, with their back-five able to rival the best in the game when on top form. Akuila Uate always entertains, and Joseph Leilua looks like he’s eaten someone during the off-season. Let’s remember how a loss to this same Knights outfit at the end of last year proved costly, and how things unravelled in Newcastle in Round 1. The Knights often look to simplify the game of rugby league, and have had a strong affinity with children’s toys, such as Lego, for many years. Wily campaigners like Kade Snowden and Beau Scott know exactly how to build a game around a solid base, and when you add that to the strength and power of Tariq Sims, such a team construction ensures they are never a pushover. For the Warriors, the return of the Wigan Warrior is particularly exciting. Tui Lolohea has made himself indispensable over the first 10 weeks of the competition, featuring heavily in recent weeks on the defensive end. But when Tomkins joins the attacking line, at second or third receiver off a ball from Johnson or Townsend, the Warriors instantly look more threatening. No doubt the connection will be slightly rusty, but look for the freshly-shaved Tomkins to do something special on Sunday afternoon. Siliva Havili is another who gets another opportunity after a long break away from the NRL. For Havili, it hasn’t been injury that has kept him away, but instead the likes of Thomas Leuluai and Nathan Friend standing in his way. This week provides the perfect platform to show not only the Warriors, but the rest of the NRL, he’s got what it takes at the top level. Havili must have been starting to question his future at the Warriors, especially with Isaac Luke’s signing for 2016, but the injury to Leuluai gives Havili the opportunity he’s been waiting for. Let’s hope he grabs it with both hands. It’s also another triple-header this week, along with Women in League round, so be sure to get down early. What better way to show some love to the women in your life by bringing them along to Our Rightful Home. I’m really interested in how the young Warriors centres handle the attacking strength, size and skills of Leilua and Mata’utia. Both Tui Lolohea and Solomone Kata have been permanent fixtures in the Warriors’ side, but with Konrad Hurrell due back from suspension shortly, and other outside backs returning, every performance will serve as a trial, and they’ll need to earn their spot week after week. The optimism is back in Warrior Nation but, as exciting as that is, I’m not totally convinced just yet. Back-to-back wins in Sydney should be celebrated, but the Eels and Sharks aren’t likely to be there at the pointy end of the season. The Knights will make it tough, and I can see this being a scratchy performance as the Warriors look to get that winning feeling back at Mt Smart. Warriors by 8.